BRAD HOYT: My hometown is Muncie, Indiana. I moved around a lot after graduating from Ball State in the mid 90s, spending time in New York City, Aurora, Colorado and Prague in the Czech Republic before moving back to Indiana. Then a couple years ago, I relocated back to Colorado. I like the people here and living within driving distance to the mountains. For me, the effect of looking out over the mountain range every morning is similar to looking out over the ocean. mwe3: What instruments do you play? What were your early musical studies like and how do you balance your interest in both the keyboard and harp guitar? BRAD HOYT: Ive never tried to balance my interest in respect to different instruments. I am first and foremost, a pianist. Its the instrument Ive played since before I could talk. During my college years, I became a marginal guitarist while taking classical lessons and forcing my fingers to do the basic movements. My fascination with plucked strings actually started in the recording studio when I added a plucked piano part to a tune. Since playing the piano in this manner wasnt very practical, I later came up with the idea of finding an instrument that would resemble a portable plucked piano. With this in mind, I scoured musical instrument museums and instrument databases cataloging all kinds of stringed instruments that might approximate this idea. It was during this time that I discovered the harp guitar. The harp guitar that I play today is the result of a four year design and construction process with master luthier Stephen Sedgwick from the U.K. His expertise made my drawings a reality and thankfully, the resulting 30-string harp guitar, which Stephen coined the arpa viola caipira was a success. Ive played my harp guitar since 2008 and before and since then, whatever music I happen to be writing has always dictated what instruments I decide to play. mwe3: When did you start taking the piano and guitar seriously and how did you move from guitar to playing harp guitar and for those who might not know, can you explain a little what a harp guitar is and what are the challenges of playing it? 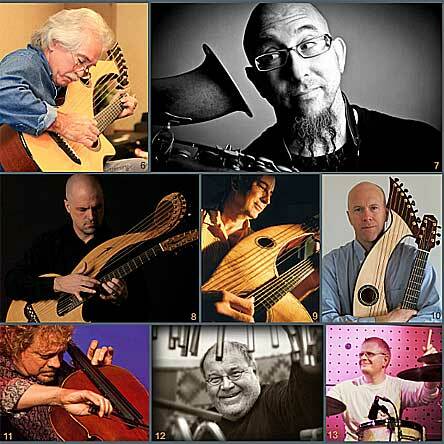 BRAD HOYT: A harp guitar is a guitar with additional open strings that are meant to be played. These additional strings can provide extra bass and treble range to the instrument and can affect the tone nicely with their sympathetic resonance when they are not being played. One challenge of playing this instrument is that you must be comfortable with stretching out your hand to play strings that are far apart. I think this particular aspect was a little easier for me due to my experience on piano (playing octaves, etc). Ive always wanted to take music seriously. I think the turning point was when I was a senior in high school. As I was sitting at the piano, I created a little 8 bar melody with some chords. It was a short melancholy passage and as I was playing it, I came to the realization that it wasnt from somewhere else. Once I recognized that, I played it over and over again. From that point forward, my main focus was to try to create something new again, documenting and recording most of the new pieces I would come up with. I have never been an outstanding performer. Creating the music was what caused me to take things more seriously. Regarding the instruments, I view them as a means to an end - the end being good music. I never really moved from the standard 6 string guitar to the harp guitar. Actually, two years before I received my harp guitar, I found a 10-string Brazilian viola caipira (country guitar in Portuguese) that I could play until the harp guitar was finished. My harp guitar is actually a harp guitar version of the Brazilian viola caipira so it made since for me to practice first on the traditional 10-string instrument before transitioning to the arpa viola caipira. mwe3: Can you say something about your different instruments? For example on the Far Away From Everyday track called Impossible Liaison you play piano, harp guitar, something called orphica piano, harpsichord, spinet, ukulele, something called Wrenchenspiel and even 8Di Oboe. Can you say something about combining all those instruments on one track and what instruments do you prefer? 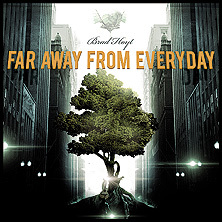 BRAD HOYT: On this new CD Far Away From Everyday I am mainly playing some form of keyboard instrument (mostly piano) and my harp guitar. The instrumentation that I eventually settled with was dictated by the kind of sound I wanted for the particular music I was working on. Most of the additional instruments I play beyond piano and harp guitar are used to add different shades or colour to the sound. In the case of Impossible Liaison, the harpsichord, spinet and other instruments were added because I wanted to create a Beatlesque sound during portions of this recording and I think these instruments helped with that a lot. Whenever I played instruments other than piano or harp guitar on this CD, the goal was always to create a new, unique and usually uncommmon instrumentation that fit the music that was at the same time new and unique. mwe3: Your new CD, Far Away From Everyday features a number of musicians including the albums co-producer Gregg Miner. Can you tell us how and when you met Gregg and what were some of the processes of working together with him on the production of the CD? BRAD HOYT: I met Gregg because of his website  www.harpguitars.net. During my search for this portable plucked piano instrument I had in my head, I found his website and saw all kinds of harp guitars. One I noticed had open sub-bass and super-treble strings. This harp guitar variation seemed to come very close to what I had in mind so I had a correspondence with him regarding harp guitars and I met him at the 2nd Harp Guitar Gathering in Williamsburg, Virginia back in 2004. Gregg was a co-producer on both Together Alone | Duets with Piano and Harp Guitar and Far Away From Everyday. Greggs main contribution is that hes been a great soundboard. Its been very helpful to run ideas and recordings by someone who is honest and discerning. Being able to process critical feedback from someone with his expertise has been a great asset. mwe3: What was the recording process like on Far Away From Everyday? For example were you in the same room with all the musicians or were the tracks recorded in remote locations and added via overdubbing? BRAD HOYT: Far Away From Everyday would have been impossible for me to do 10 years ago. All the musicians who participated on this CD recorded their parts either in their own studio or a local recording studio in their area. The advent of quick file transfers via the internet, wide access to professional quality recording gear and the advances in music production and technology have had a significant effect on musical collaboration. The possibilities created by this technological progression have made this project very rewarding for me. Percussion  Played by Jon Crabiel and the late Tom Roady. Jon is a good friend and percussionist whom I performed with many times in Indiana. I met Tom in Nashville. He was a very cool guy who recorded some extra colours for me to use during our recording session during the summer of 2011 with Tom Shinness in Nashville, TN. 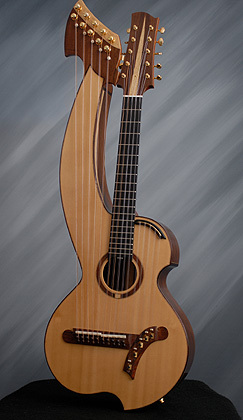 21-string harp guitar  Played by Muriel Anderson. Shes one of the more accomplished harp guitarists that Ive ever seen or heard. We collaborated on the tune Tonight We Dance back in 2009 which I think turned out great. Fretless bass, drums and clarinet  Played by my bandmates from Prague: Alexander Jurman, Ales Pavlícek and Pepson Snetivy. During my time living in the Czech Republic, we played countless gigs throughout the country. Far Away From Everyday was a tune we actually played back then. Ive always thought their talent and creativity was top notch and working with them helped me grow as a musician. Alexs bass line is a highlight for me. Cello  Played by Russick Smith. Last summer I was walking on the main street in Breckenridge, Colorado and noticed a cellist playing on the street corner. I couldnt make out his visage due to his dipped cap and handle-bar mustache, but his playing was excellent. Knowing that I needed a cello on this track and struck by the opportunity of adding yet another unique musical voice to this music, I introduced myself and two months later, he contributed a fine cello part. Oboe  Loreena Hoyt. The first arrangement of the tune I did back in 2000 called for a small harmony to the clarinet line played on oboe. I played an oboe patch on a keyboard back then but this time around, I happen to have a daughter who is a solid up and coming oboist. She pulled it off nicely! I played piano on the track. and this is just one track. The other tracks are similar in this way. mwe3: When were the tracks on Far Away From Everyday written and can you tell us something about your song writing style or approach? Would you say youre a melody man or more interested in improv? BRAD HOYT: Some tunes on the CD were written within the last couple years with the goal of recording them for this project. Others were written much earlier, then rewritten and revised while others were written long ago and have essentially remained the same. Regarding my approach to writing and melody, Im only interested in what best fits the purpose of the music. A tune like Sharpers Revenge may call for more improvisation while another tune like Beneath The Iron Gate does not since its a slower more deliberate tune with a distinctive melody. In my opinion, the quality and strength of your melody is a significant factor that determines how well you can communicate to the listener. As a composer, an important goal for me is to create a melody and music that communicates emotions to others. The better you get at defining and refining your melody and music, the better youll be at getting your point across that you want to communicate. Thats just my take though. There are many other approaches out there. 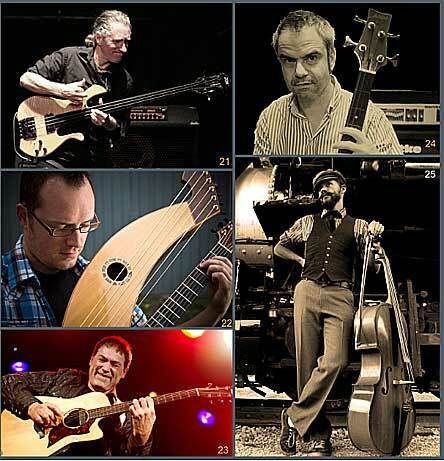 mwe3: How many musicians are featured on the new CD and how did you choose the various harp guitarists who ended up recording on the Far Away From Everyday album with you? 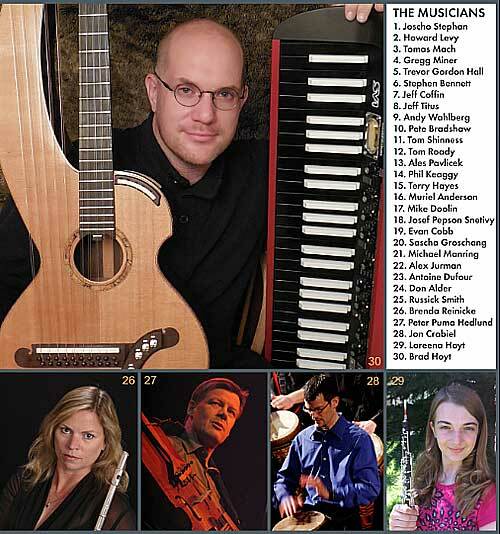 BRAD HOYT: Including myself, 30 musicians appear on this CD. 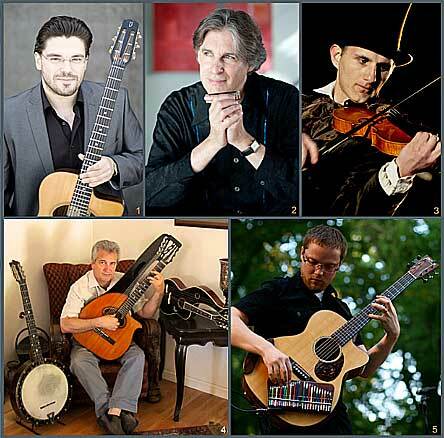 The main criteria for choosing the harp guitarists were that they were some of my favorite players. I liked their style, musicianship, etc. mwe3: Also what was it like working with guitar ace Phil Keaggy on the track Look Inside? BRAD HOYT: Great! I wrote the tune Look Inside during a time when I was listening to his CDs Beyond Nature and Find Me In These Fields. Not only did I love his guitar playing, I was also effected equally by his compositions and the cello work of John Catchings. When it came time to record this tune, I thought that the ideal arrangement would include Phil Keaggy and an amazing cellist. Then, when I heard Sascha Groschangs cello on the Barnaby Bright tune Yellow Moon, it all came together. I had to at least contact both of them to see if we could do this recording. Thankfully it happened and I love how the music turned out. mwe3: Theres so many different harp guitar (and guitar) sounds that were recorded for Far Away From Everyday. Was this deliberate? BRAD HOYT: My intention when putting together this music was to create variety so that the listener would be constantly (and pleasantly) surprised each time they would hear a new track. 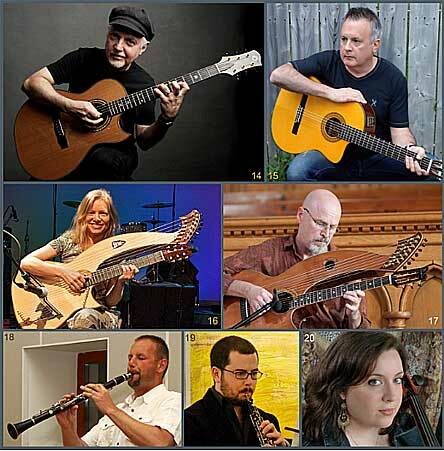 In the end, the variety of not just the guitars and harp guitars, but of woodwinds and strings was more that I originally anticipated. It went beyond my expectations for sure. mwe3: Gregg describes making the CD in his liner notes for Far Away From Everyday and he refers to the music on your album as being a kind of chamber-jazz. Is that a good way to describe your new album and how would you describe the music you recorded on Far Away From Everyday? BRAD HOYT: The best way to categorize the music on the CD would be to listen to the tracks and then determine what genre each one belongs to. Each track kinda falls under a different category which makes it hard to label the CD as a whole. I think Gregg used the term chamber-jazz because each track does consist of small ensembles and improvisation is an important element on every track. mwe3: Can you tell us about your harp country guitar, the Arpa Viola Caipira, and some of the challenges of playing it as well as the tuning issues and other details? BRAD HOYT: My harp guitar is a one-of-a-kind harp guitar version of the 10-string Brazilian country guitar or viola caipira. 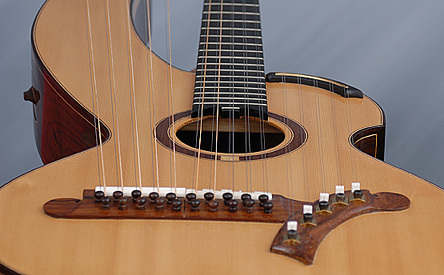 The reason I decided to have the harp guitar based on this instrument is because the viola caipira uses light gauge strings and the primary (almost exclusive) playing technique of the traditional instrument is to play with the fingers instead of a pick. The general idea was to have a harp-like portable piano that I could pluck or play with the fingers (like plucking the strings of a grand piano). Its challenge to play but not absurd. There are other instruments that are far more difficult. For example, the Austrian concert zither is a nightmare. After I spent a few hours trying to play it, I wanted to crush it in frustration. The main challenge during the construction was figuring out how to fit the tuners for the doubled sub-bass and super treble courses on the instrument. Both bass and treble harp sections consisted of five doubled courses (10 strings total). For the basses, the builder Stephen Sedgwick used Steinberger tuners. This was a relatively easy solution compared to the treble strings. For the trebles, Stephen created a treble tuner unit in the upper bout that contained the cranks from 10 viola bows. The ends of these cranks were squared off and I use a special key to tune the strings. Its like having a little zither morphed into the body of the instrument. Needless to say, Stephen knocked it out of the ballpark. Its an amazing harp guitar. mwe3: What else do you like to do outside of music to keep you relaxed and keep your mind fresh? BRAD HOYT: Im from Indiana so I can play basketball. Ill be rooting for the Pacers to beat the Heat this year and win the whole thing. Id like to see them take home their first NBA championship. Ive also been a Colts fan since they moved to Indy in 1994. I think the best thing you can do to keep your mind fresh is to exercise, eat right and get enough sleep. My goal this year is to work at all this stuff. mwe3: What have you got planned for your music as far as writing, recording and performances on tap for 2014? 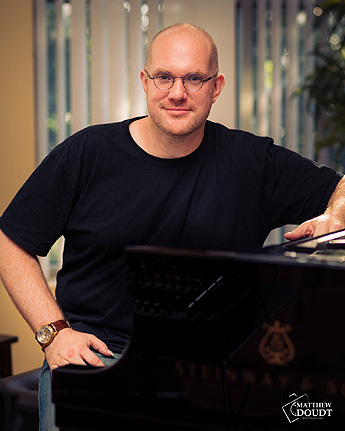 BRAD HOYT: My initial plan was to record a trilogy of CDs with the first one featuring duets with piano and harp guitar (Together Alone), the second one featuring harp guitars in ensemble settings (Far Away From Everyday) and the third featuring harp guitars within the whole spectrum, from solo to symphonic (Theres The World  working title). These particular projects are very time consuming but very rewarding to finish. So far its taken about three years to produce each one. Knowing this, Ive decided to dedicate this year to completing a solo album so theres not another 3 year gap between releases. Im looking forward to incorporating some new recording and playing techniques on this new solo project that will expand the type of music I can write with my particular harp guitar. Itll be fun!